The Animal Alphabet helps children remember the shapes and sounds of the letters. Letters are symbols and are very abstract for young children. The more abstract learning is, the less the students understand and remember. Zoo-phonics® uses Animals in the shapes of lowercase letters before teaching the actual letters. Sequentially, the child learns first the Animal Shapes, then the Merged Animal Letters and finally, when developmentally ready, the letters themselves. Letter sounds are taught before letter names. We do not read with letter names, we read with sounds. These sounds are the same sounds that children have heard from birth. According to research, neurons are assigned to sounds that babies hear repeatedly. Later these same neurons will be responsible for making the connections to reading and spelling. Reading and spelling, then, should be taught through the same auditory system (language) that children have known from birth. Learning the sounds of the alphabet is essential for beginning readers. Zoo-phonics® teaches the sounds of the letters through the animal names (“a” as in alligator, etc.). Research shows us that, letter names initially provide no link to the letter sounds. Expecting children to learn the letter names at the same time as letter sounds may only be confusing because children hear two distinctly different sounds. (Try this: Say the letter name. Now say the letter sound. If you repeat this with each letter of the alphabet, you will hear the difference between the letter names and the letter sounds. That reading materials are written 95% of the time in lowercase letters? That it is easier for a child to read sentences written in lowercase letters than capital letters because capital letters are all the same size? That often first and second grade teachers have to work with students all year to break the habit of inappropriately using capital letters? Let’s teach them correctly the first time around! The Body Movement for each Animal Letter helps “cement” the phonemic information into memory. Research states that when the body moves, the brain remembers. The Zoo-phonics® Body Signals allow children to put their natural “wiggles” to good use and act as a cue for memory. We know statistically that anytime we physically perform, memory is enhanced. The alphabet is taught sequentially, and as a whole entity, “a – z.” The alphabet is not fragmented. The alphabet is one unit with 26 parts which are all necessary for reading and spelling mastery. Why take 26 weeks to teach something that can be taught in a few weeks? Emergent learners can use the whole alphabet immediately because the Zoo-phonics® Animals and Signals make it so concrete and playful. Short vowels are taught before long vowels. It is much easier for a child to remember the sounds of a word with two and three letters, than to memorize the configuration of larger words. Most long vowels are found in larger words because they require other vowels to create the long sound. When children are ready for more advanced concepts, long vowels, diphthongs, silent letters, and soft sounds are taught with the Animal/Letters through Signals, stories, music and skits. Phonemic patterns (at, bat, fat, sat, etc.) are taught first rather than random word lists (of, it, then, was, etc.). Children are “naturals” at locating patterns. Patterns help them make sense of their world. You wouldn’t teach the times tables by mixing up the multiplication factors. Why, then, do we teach reading and spelling so randomly? Zoo-phonics® teaches children, through repetitive patterns, to make them aware of the patterns in speech and text. 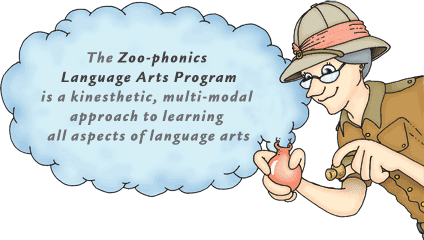 The Zoo-phonics® curriculum is fully integrated with other subjects. FREE! Zoo-phonics® Fidelity Paper Maximize learning!